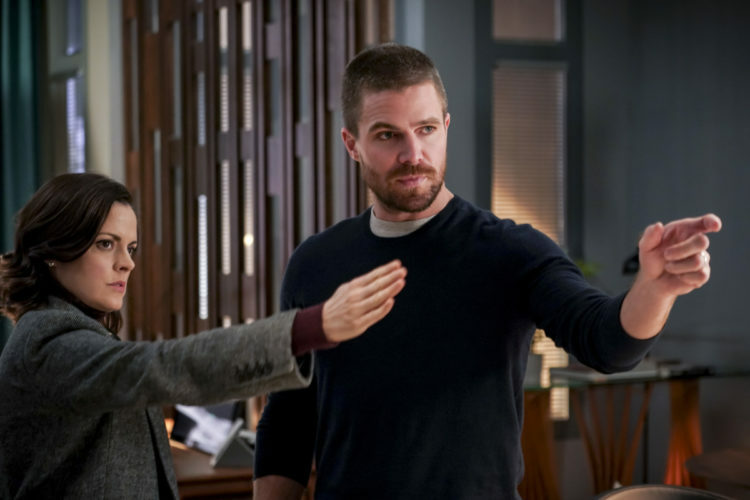 Arrow Season 7 Episode 12 Review: "Emerald Archer"
When I first heard that Arrow‘s 150th episode would be a documentary-style hour, covering Oliver and the team’s transformation from vigilantes to heroes to now, according to Star City standards, outlaws, I was nervous. To be honest, the idea felt both too silly and self-important for Arrow, and I feared that it would be more outrageous and off-brand than a musical episode, which Stephen Amell has always promised would never happen on the series (For the record, I am almost always down for a good musical episode). And although my worst fears aren’t realized in “Emerald Archer,” as it remains a mostly grounded hour featuring Oliver and his allies facing off against a vigilante-hunting nemesis, it does still fail to reach the heights it could have. Ultimately, it’s a surface-level episode that offers many moments viewers want to see, including the return of the “real” John Diggle, but it never does the legwork to actually earn these scenes, which is why so many of them don’t emotionally connect with me in the way I wish they had. The main victim of this superficial style of storytelling is John Diggle, who finally starts acting like the character we used to know in “Emerald Archer.” However, can we say that the true Diggle is back if he never actually admits his wrongs, if he never apologizes for how he turned his back on Felicity at the start of this season, how he is keeping Diaz’s presence in ARGUS a secret from Oliver while chastising his best friend about not telling him about Emiko sooner? What happens with Diggle in this week’s Arrow can’t really be considered character progression or redemption because we never actually witness any type of deep thought or hard work from him to better himself. Instead, what we get from Dig is a half-baked (but well-performed by David Ramsey) speech to Oliver about how his going to jail never sat right with him and how the team has had each other’s backs the entire time they have been broken up, two statements that definitely don’t track with what has actually happened this season. If Oliver going to jail truly hadn’t sat right with Diggle, he would have prioritized taking down Diaz and securing Oliver’s release over ARGUS protocols. If the team had truly had each other’s backs, Diggle would have gone to any length to help Felicity instead of conforming to ARGUS standards, and Dinah would not have arrested Rene, and Felicity wouldn’t have felt forced to turn to Black Siren to help get Oliver out of prison. What Diggle’s saying is essentially lip service, words with no actual, substantial backing, but I allowed myself to be content with it simply because it was great seeing John Diggle and Oliver Queen back in the same room again, talking about a mission rather than bickering about who deserves to be the city’s Green Arrow. So if I’m honest with myself, “Emerald Archer” doesn’t really work as an episode of Arrow this season. Oliver seems too preoccupied to spend time with his own son, and while it’s wonderful to watch Felicity and William’s relationship blossom, to the point that he’s okay with admitting to her that he got expelled, Oliver’s complete absence in William’s storyline does not fit with the caring, concerned parent we have seen throughout Season 6 and even throughout Season 7, even with Oliver being stuck in prison. Diggle says all the right things to Oliver, about learning from mistakes and growing from them, without ever truly acknowledging his own faults. Curtis, Rene, and Diggle all suit up, despite Oliver telling them not to because of the anti-vigilante law, and the mayor’s sudden change of heart saves them in a plot contrivance that anyone could see coming from a mile away. Sure, it’s great to see familiar faces like Quentin and Thea and Sara (I also loved seeing Rory, aka Ragman, who was and still is my favorite of the Newbies), and sure, it’s awesome to hear Dig tell Oliver all these positive, encouraging words. However, none of this changes the fact that Diggle has been written inconsistently all season long, or that Felicity receives barely any focus during this hour, despite being one of the founding members of Team Arrow, or that the team is still just as damaged and broken as it was last season. But the Arrow writers don’t want to dive deep and try to fix those problems during the show’s 150th episode. They want to provide us with the show’s greatest hits and tantalize us with the hope that the show will return to those roots soon without actually doing any of the more challenging character work. They want to give us what we want to see without actually giving the characters what they need. That’s why “Emerald Archer” is the fast food of Arrow episodes; it tastes good in the moment but provides no nutritional value. I’m okay with that every once in a while, but the series needs to address these issues with their characters sooner rather than later. Otherwise, what’s the point of investing our minds, hearts, and time? If these characters aren’t going to be treated and valued as real people, even within this fictional setting, then why should we care? We’ve been with these characters through 150 episodes now. I believe they deserve more. There’s a single flash-forward in “Emerald Archer,” featuring Blackstar watching an old copy of the documentary and finding her way to the Arrowcave. But she doesn’t appear to be a fan of everything Oliver and Team Arrow did in the past, saying that vigilantes got exactly what they deserved when they were pushed out of Star City. Grant Gustin’s cameo as Barry in this week’s episode is the most I’ve liked Barry Allen in a long time. From the interview’s awkward start to what he had to say about Oliver not wanting anyone to live through the damage he’s experienced, I thought his scene was terrific. What did everyone else think about Arrow‘s 150th episode? Comment below and let me know.